Just last week, authorities were shocked to find the remains of eight bodies in what appears to be a string of particularly brutal murders in the Mexican tourist hotspot of Cancun. The discoveries of these bodies, several of which were violently mutilated, began late at night on Monday, August 20, and endured throughout the day on Tuesday as authorities continued to uncover remains. These findings, though horrifying on their own, are representative of the growing problem of gang violence in Mexico’s most popular tourist destinations. The first two victims were found late Monday night in the trunk of an abandoned taxi. The next two were found at another location, dismembered and in plastic bags. The fifth was discovered bound and shot dead, a sixth shot in a hammock, and another shot and covered in a plastic bag (Time). The eighth and final victim was found decapitated and disposed of in a nearby neighborhood (Univision). Unfortunately, gruesome discoveries such as these have become increasingly commonplace in popular resort towns such as Cancun in the state of Quintana Roo as criminal organizations expand into the region. A similar string of violence in April of this year left 14 killed and 5 injured over a span of just 36 hours, making April 4th the bloodiest day in the city’s recent history (Noticias Ya). As these organizations, which are fueled by the business brought by tourists, have become increasingly influential in the region, violent crime has soared. In just the first few months of 2018, the murder rate in the state of Quintana Roo (which houses popular tourist destinations such as Playa del Carmen, Cozumel, and Cancun) rose by 132% from the previous year (The Guardian). Though the majority of this crime has occurred outside of the region’s main resort zones, it is nonetheless indicative of a severe security crisis that endangers the lives and livelihoods of locals, and one that could very possibly spread further to directly threaten tourists in the future. This rise in violent crime broke international headlines earlier this year when an explosion on a ferry in Playa del Carmen injured over 20 people, including 5 American tourists (Business Insider). News of this explosion, followed by the discovery of explosives on a different ferry near Cozumel, triggered a U.S. Embassy alert warning of a ‘security threat’ in the area. Though the state of Quintana Roo is known for its relatively low levels of criminal activity, this appears to be changing as criminal groups compete for the territory, sending the region into levels of violence that resemble much of the rest of the country rather than a paradise getaway. The major players in this conflict are reportedly the Zetas cartel and the ‘Cartel de Cancun’, an independent organization with ties to Mexico’s famed Sinaloa cartel (NY Post). The Cartel de Cancun is reportedly led by a woman named Leticia Rodriguez Lara, a former police officer and one of the only women in Mexico to lead her own drug gang. Her group has infiltrated security forces and engaged in territorial disputes, drug sales, and extortion (Business Insider), contributing to the violent state of Mexico’s beloved tourist towns. She was arrested in Puebla, Mexico last August and currently faces trial for various criminal activities; however, the violence and territorial conflict has yet to cease. With this recent spike in violence associated with the drug trade, many are concerned that Quintana Roo’s tourist industry may suffer as crime escalates, leading these cities to the same fate of Acapulco and Los Cabos. These cities, once bustling international tourist destinations known for their pristine beaches, have become overridden with gang violence in recent years, leading travelers to seek new and safer destinations to vacation. Acapulco, known in the 1960s for its popularity as a beach destination for many of America’s celebrities, quickly declined into a state of violence as it was overrun by cartel activity. Though President Calderón attempted to combat this disorder by declaring ‘war’ on Mexico’s organized crime (Washington Post), this initiative was largely ineffective, as many members of the region’s security forces are themselves engaged with the criminal organizations. 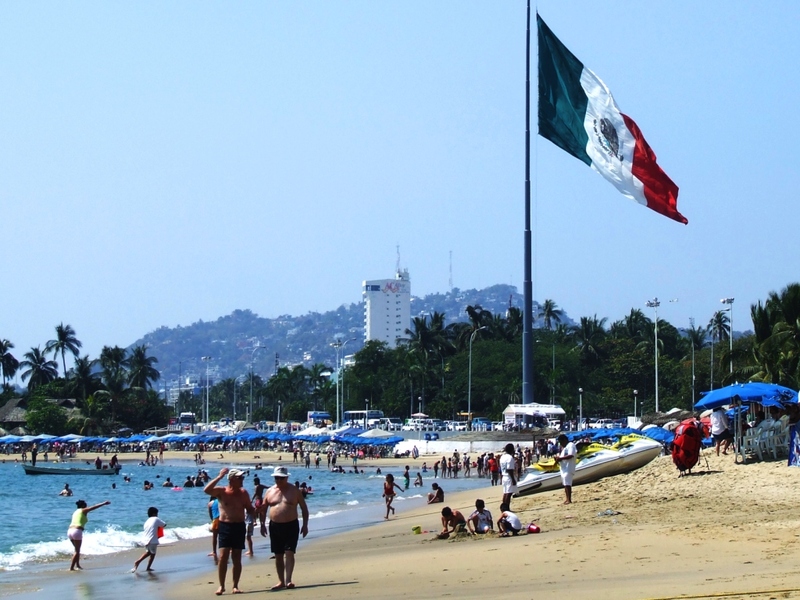 Today, Acapulco is known as the ‘murder capital’ of Mexico. Los Cabos, a popular resort location on the southern tip of Mexico’s eastern Baja California peninsula, has met a similar fate in recent decades. This location, while providing cartels with the tourist consumer market, also acts as a port to transport drugs to the U.S., making it prime real estate for narcotrafficking groups (El Confidencial). Violence has recently skyrocketed in this region, increasing by 500% between 2016 and 2017. Los Cabos now has the highest homicide rate in the world. These examples paint a rather grim picture for the future of Mexico’s popular spring break destinations in the state of Quintana Roo. And, without a security force that acts independently from drug cartels, no amount of policing is going to solve the problem. Few of these instances of violence directly affect tourists, with the majority appearing to be targeted—and for this reason, few foreign leaders address the dangerous state of these regions or even issue travel warnings. However, leaders in countries such as the U.S., Canada, the U.K., or France, must address the fact that, though their citizens are not facing the violent consequences of the drug trade, they are the tourists that continue to bring in the business to keep these organizations running. Without acknowledging that the root of this issue is the purchasing and consumption of illicit substances by foreign tourists, the demand will only continue to rise, and innocent Mexican citizens will continue to face the violent consequences as a result. Mahita Gajanan. (2018 Aug 22). "Mexico Travel Warning Issued After Bodies Were Found in a Taxi, a Hammock and Bags". Time. Retrieved Wednesday, August 29, 2018. Univision. (2018 Aug 22). "Hallan ocho cadaveres en Cancun, dos decapitados y otros descuartizados". Univision. Retrieved Thursday, August 30, 2018. Elsy Pineda. (2018 Apr 13). "Tan solo en 36 horas asesinan a 14 personas en el turistico cancun". Noticias Ya. Retrieved Thursday, August 30, 2018. David Agren. (2018 Jul 24). "Mexican news director shot dead weeks after colleague's murder". The Guardian. Retrieved Thursday, August 30, 2018. Christopher Woody. (2018 Mar 10). "Mexico's surging narco violence is intensifying at the edges of one of its biggest tourist hotspots". Business Insider. Retrieved Tuesday, August 28, 2018. Joshua Partlow. (2017 Aug 24). "Acapulco is now Mexico's murder capital". The Washington Post. Retrieved Wednesday, August 29, 2018. Adrian Espallargas. (2018 Jun 13). "Sangre y lujo en Los Cabos: La ciudad mas peligroso del mundo es una joya turistica". Retrieved Tuesday, August 28, 2018.